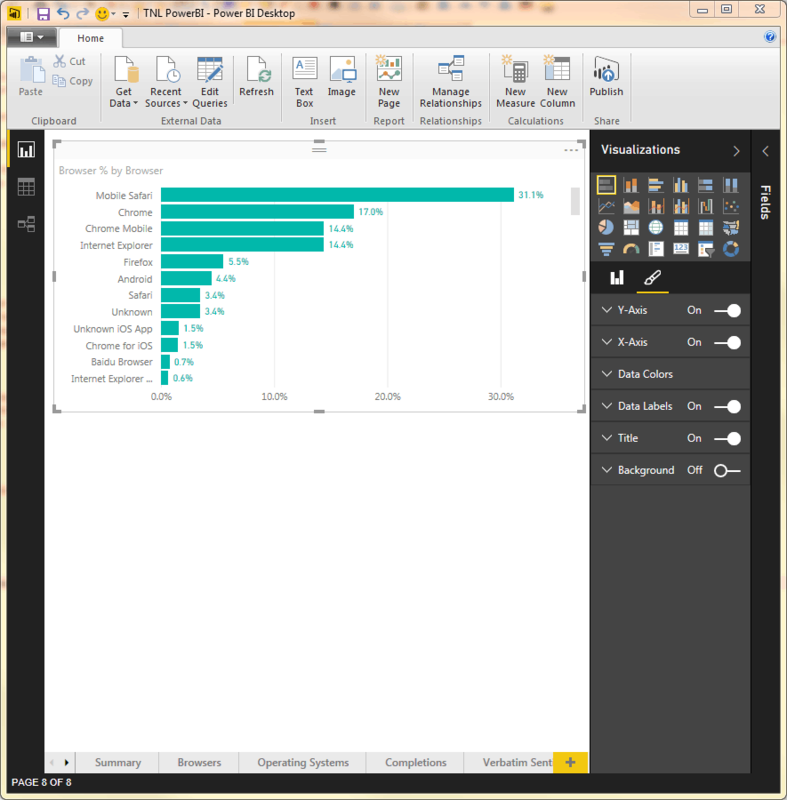 If you need to add ‘Percent of Total’ to your charts in Power BI, here’s how..
Microsoft’s Power BI is excellent. It is so easy to get up and running with data coming from a multitude of places. 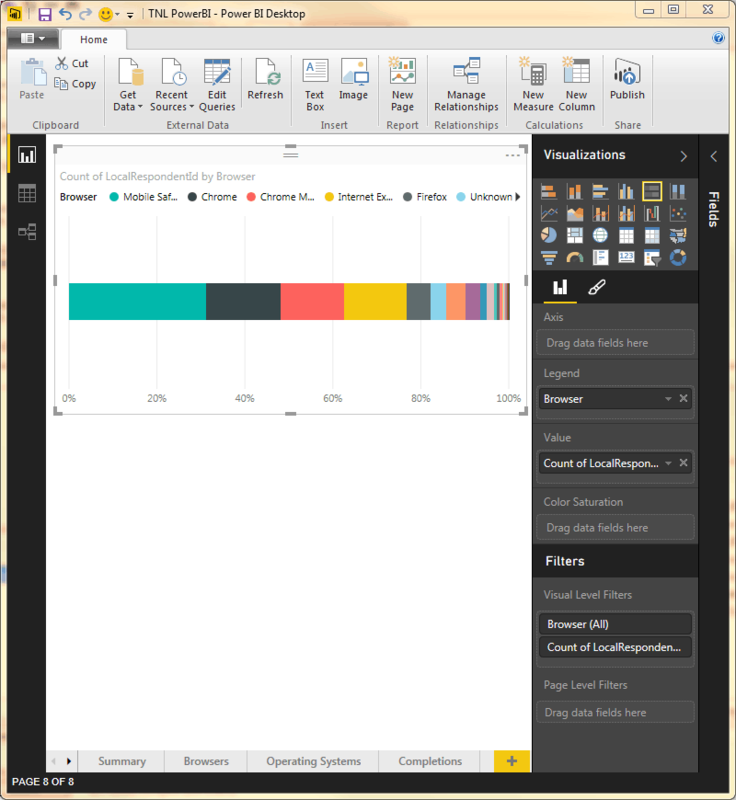 Out of the box you can easily show facts and figures related to your data. One thing it currently misses though is a ‘percent of total’ aggregation for measures. Recently I wanted to show browser usage for visitors to a web based questionnaire. The client had asked to see the browsers ordered by popularity with their respective percentage share displayed. but with a lot of browsers that is not a workable option. 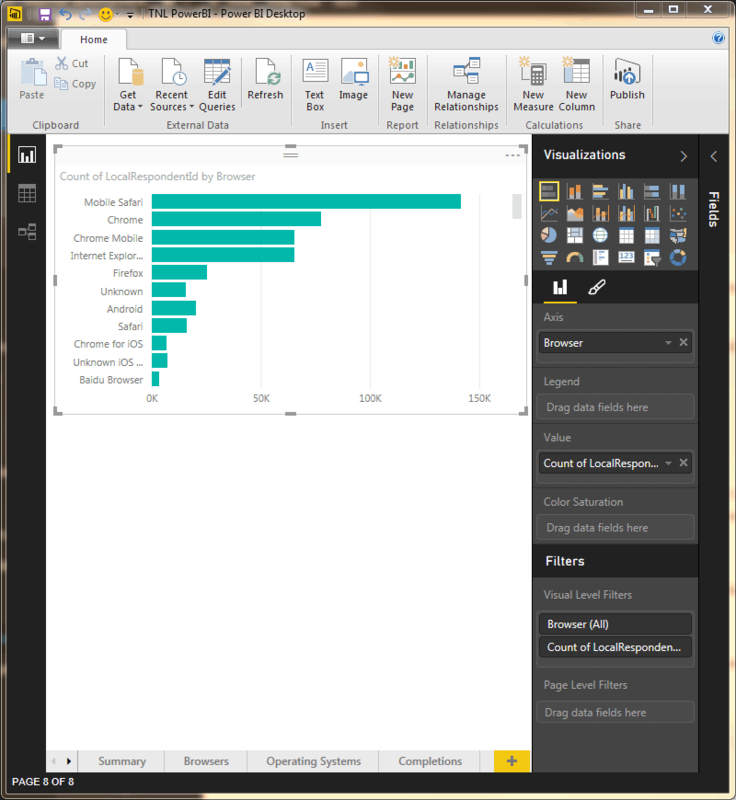 Luckily Power BI lets us create our own measures using DAX. To do so , you need to right-click on your data table and select ‘New Measure’. You can then enter your measure name and a DAX expression. 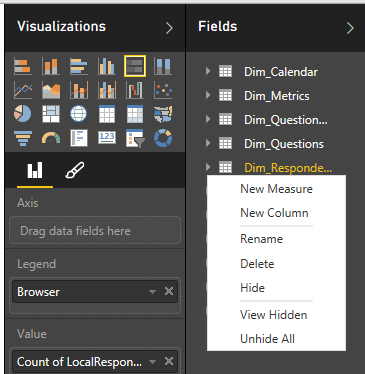 (See ‘DAX basics in Power BI Desktop’ for basic DAX information). For our purposes we would like to know the number of respondents with a particular browser divided by the total number of respondents. Before I create the measure though we need to consider that it is highly likely that this chart will have been further filtered – maybe by date or something else. Our calculation must take that into account. The easiest way to express it is to say that we need the number of respondents for a particular browser taking into account all applied filters divided by the number of respondents for all browsers taking into account all applied filters (sorry, I know that is a long-winded statement, but bear with me). Note that I haven’t multiplied the answer by 100 because it is better to click your new measure and set its format type to ‘Percentage’ in the Modeling tab. One last nice touch is to put the percentages on the graph by setting Data Labels to ‘on’. I have read books on Dax on Bi and Dax and honestly, your demonstration is the ONLY sound one I found on this topic. You provided the best forwarded solution for calculating percentages in power BI. Looking forward to more insight from you. Thanks for that comment, it’s great to hear that I have helped someone. Thanks it was a real solution to my problem! thanks a lot! Thanks for your comment Luis.